This ink was recommend to me while I was purchasing a customer made fountain pen (I promise to have a long overdue review done for this soon!). I have found this ink to be a tad bit inconsistent in the depth of colour while writing. Certain parts of my letters look more of a darker red whereas other parts look a faded/paler red. The shading test was really interesting as I found that at stage one it looks a deep red but by the time I reached stage 3 for me it looked a very deep brown/red mixture. 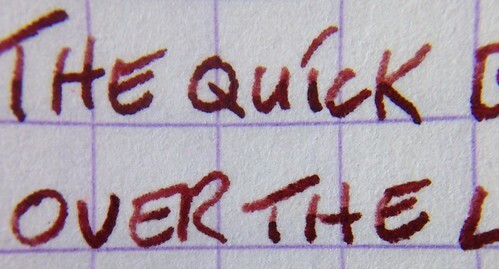 The Oxblood for me lays down pretty wet, so as expected it does take a decent length of time to try. I found even after 15 seconds it was still smudging! 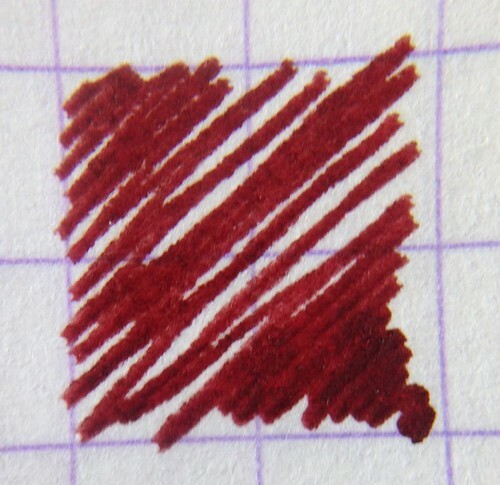 I actually found this ink to take a longer cleaning time when put of against the first ink I reviewed. It took a lot more flushes of water before it started to run clear. This is my second go to ink for everyday use which has surprised me as I wouldn’t have classed this colour as a everyday ink choice. Maybe I am behind in the times for ink colours but I normally would have thought of black and blue as a everyday ink colour to use. What do you use for your everyday ink colour? I would love to find out! Its a great ink that I would happily recommend to anyone!